This January, the lucky mare that is my sister visited Dubai and bought back an unusual gift for me – Camel Milk Soap by The Camel Soap Factory. I’ll be honest, as grateful as I was that she thought of me, I was a little bit weirded out about using anything derived from camel milk on my face. It looked and smelt very interesting though so I thought I would definitely give it a try straight away. As with all new beauty products I decided to do some research before I put it to the test though. It turns out camel milk based products are rich in Alpha-Hydroxy acids (AHAs) – the unsung heroes of the beauty world. AHAs are fantastic for gentle exfoliation and because of this, continued use will show a significance in how smooth your skin feels. Bye bye fine lines and wrinkles and hellooo brightening and even skin tone. This sounded pretty good to me, especially since I have sensitive skin and I’m finding more and more products are too harsh to use on a daily basis. For my next bit of research I went on to the the brand’s website. To my very pleasant surprise, the cleanser has no sulphates, parabens, artificial colours, artificial fragrances, petrochemicals and it’s cruelty free. All I can say that is YES!! They’ve also just won an award for being sustainable business of the year. 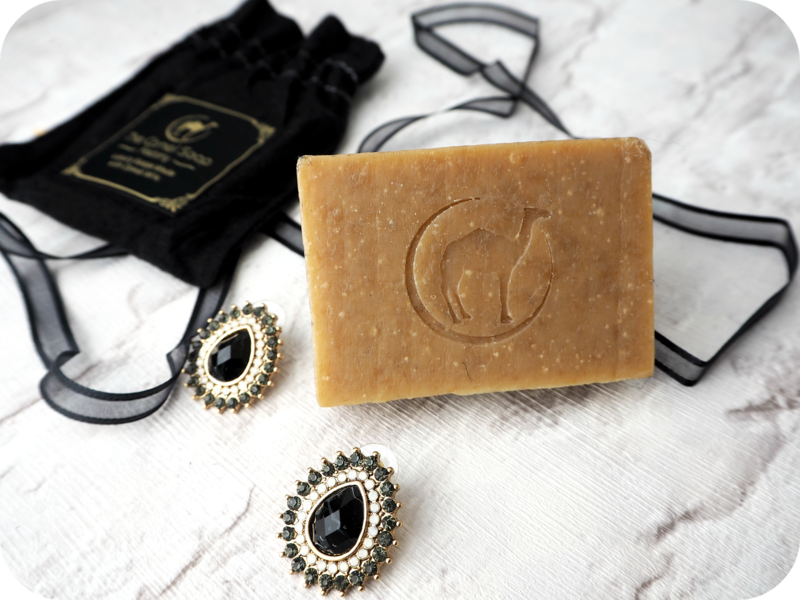 For such an eco-friendly brand, I was a little surprised I hadn’t heard of them before but it turns out that The Camel Soap Factory is a Dubai based manufacturer of soaps; all of which are handmade using Camel Milk and natural oils and butters. 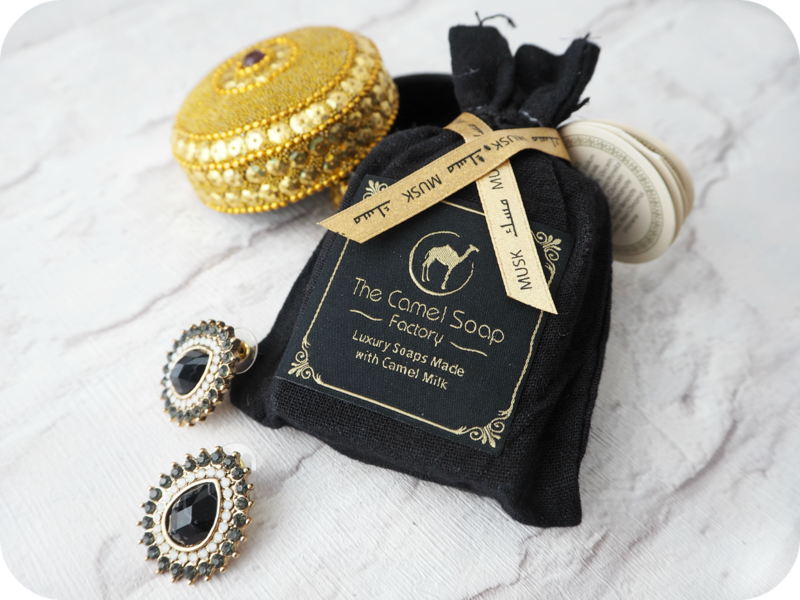 The soap comes in a cute little black pouch with the branding in gold – very luxe! The bar of soap is a beige/yellow block with the TCSF logo embossed into it. The soap is made of 33% camel’s milk (a whole lot more than most products derived from camel’s milk), shea butter and scented oils. The camel milk soap comes in a range of scents including Oud, Aromatic wood, musk and Mukhallat. The scent I have is Musk, which is beautiful. I’ll admit, initially on first sniff I was very unsure. It smelt quite strong and reminded me of my previous visit to UAE. Once I had it lathered up and on my face though, I found that it’s actually not that much of overpowering smell and it fades fairly quickly too. After a few months of use I can confirm that you don’t end up getting constant whiffs of it even after washing it off. I’m so used to using liquid cleansers that I did find it a bit weird using an actual bar of soap. It turns out that it didn’t take much to get used to it. I rubbed the soap with plain warm water in my hands and on to my face, once it lathered a little I used a cleansing brush to really work it into my skin. After it’s washed off my skin feels really soft and moisturised, definitely no tightness in my face at all. The best thing though is that the softness to my skin doesn’t disappear as the day goes on and the moisturised feeling stays too. I’ll be honest, the first few days I couldn’t stop touching my face! I noticed a little bit of brightness to my face too which was a pleasant surprise. I’ve noticed the dry patches above my eyebrows have disappeared and my skin very rarely flakes now. I was concerned that the rich ingredients might bring on a breakout but *touch wood* it’s been absolutely fine. It also turns out that camel milk soap is recommended for those with acne, psoriasis and Eczema. Although, judging by how moisturising it is, I’m not actually surprised. I’m one of those weirdos that buys products in at two’s and three’s in case I run out or the product gets discontinued so one of the first things I did when I found that I loved the soap was Google to see if there was a UK stockist. You can imagine my joy when I found that there was (just) one stockist in the UK. The soap retails at £13.99, which to be fair isn’t much at all. It lasts for ages because it’s an actual bar as opposed to liquid where you might pour out a little too much and/or lose a little. A full three months on and I’m still loving this soap. I use it on alternate days because my skin needs a deeper cleanse very often. It’s become a staple in my bathroom beauty products and I would whole heartedly recommend it to everyone. Have you tried any beauty products derived from camel milk?